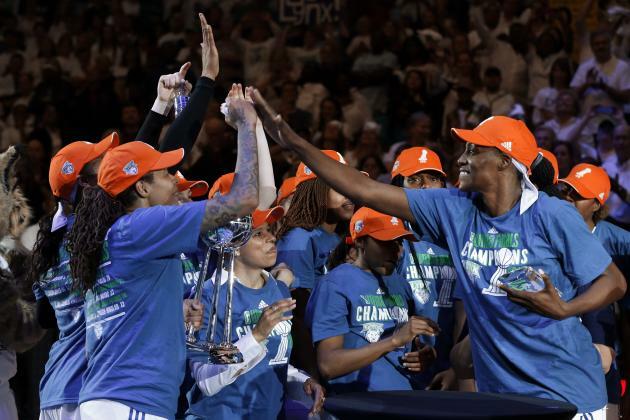 The 2015 WNBA champions were the Minnesota Lynx; their third title in five years. You can read about the argument for the Lynx being considered a dynasty here. A huge boost to the Lynx roster was their mid season pickup of WNBA all-star and olympian Sylvia Fowles who was named the 2015 WNBA finals MVP. She is one of several unrestricted free agents on Minnesota’s roster this off season. Minnesota has been a team that has built themselves up through the draft, in addition to adding key pieces through free agency. They are one of the few teams that have been able to keep a solid nucleus together for several years. Moore, Augustus and Whalen are probably the most dangerous backcourt in the WNBA and with a front court that includes Brunson and Fowles they still have the ingredients to seek banner number four. However, their roster has begun to age and the Lynx must add some youth to their squad. Whalen is 33, Brunson 35, Augustus 31, and Fowles is 30. There is no doubt that the Lynx are working to resign Fowles as she is one of the few bigs who match up well against rival center Brittney Griner of the Phoenix Mercury. Thats a no brainer. Lindsey Whalen is also unrestricted this off season and she will certainly be back with the Lynx and finish out her career in her home state. She is the key piece in directing the Lynx. Her leadership has been crucial in the success the team has seen since she joined in 2010. Also unrestricted is Asjha Jones. She provided decent backup minutes for the Lynx after missing a lot of time away from the league due to injury. The Lynx may look to go younger at this position as Jones is already 35. Renee Montgomery is also unrestricted. She made her return to Minnesota in a mid season trade that sent Monica Wright to the Storm for Montgomery and Seattle’s second-round pick in the 2016 draft. Montgomery made huge contributions to the team during her time and although she may field offers from other teams, I think she will want to stick with the team that earned her her first WNBA championship. Hopefully the Lynx will have the same feelings. The Lynx have only one restricted player on their roster and that is Devereaux Peters. Peters who will be entering her fourth season in the WNBA hasn’t seen huge minutes since she’s been in the league. In her defense, she has been on a very talented Lynx squad with veterans who played in front of her. This could be a break out season for Peters with the opportunity finally presenting itself for her to play big minutes. I’m sure other teams will look into adding the services of Peters to their roster so we will have to see how much value the Lynx place on their power forward. The Lynx are set to go in 2016. If they can avoid injury, which they succumbed to this past season but still came out on top they will again be the team to beat. Moore averaged almost 32 minutes per game last season and the Lynx will have to find a way to get that number down. Maybe through free agency or even in the draft they can find a player that can help with this. The Lynx need to pretty much get some young talent on the team that can give the vets a few minutes to rest. Players that can come in and give quality minutes. I expect coach Reeves to keep her core group of players together while adding pieces that she can build with for the future. What do you all think the Lynx need to do this offseason? Can they repeat? How can they get better? Let us know.